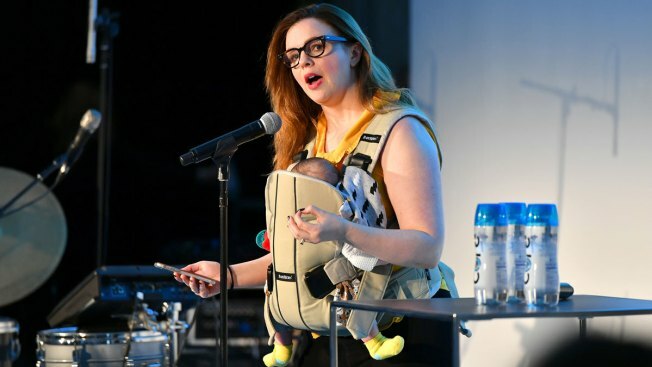 In this file photo, Amber Tamblyn speaks onstage during the "Feminist as F*ck with Amber Tamblyn and Roxane Gay" panel on May 21, 2017, in New York City. The actress is under fire for recent comments made on social media. Amber Tamblyn is facing harsh backlash on social media after tweeting about New York City’s Hasidic Jewish community following an altercation involving her daughter on Sunday. The actress took to Twitter after she said she was nearly struck by a van driven by a Hasidic Jewish man while out for a walk with her one-year-old daughter in her stroller in Brooklyn. “If anyone in Brooklyn near the intersection of Washington Ave and Atlantic Ave just saw a Hasidic man in a grey van try to hit a woman and her baby in a stroller as she crossed a crosswalk, honking and touching the stroller with the car’s bumper, please DM me. That woman was me,” she tweeted. A few hours later the "Sisterhood of the Traveling Pants" star posted a follow-up tweet that sparked anger from the twitter-sphere where she claimed this was not the first time a Hasidic Jewish man has tried to harm her. While some users backed her up, others on Twitter found Tamblyn’s word choice uncalled for and some even deemed her a bigot. While I am Jewish myself you might want to get educated on certain aspects of Hasidism. This is Haredi Judaism or Satmar and yes they do have some problems. Watch One of Us on Netflix. Please don't think all Hasidic Jewish men are like this. I'm just curious how many people are now going to assume that every Hasidic man walking or driving down the street is the one who attempted to harm you? You don't feel remotely concerned about profiling? The replies to your tweet are quite telling. Tamblyn responded that her husband is Jewish and that the criticism reeked of sexism. I’ll say this once. To anyone suggesting I’m anti-Semitic for identifying a man as Hasidic who hit my daughter’s stroller in a crosswalk with a car then rolled his window down, wagged his finger and told me “Watch where you’re going”: I will not be bullied or intimidated by you. It is not confirmed if Tamblyn filed a report with the NYPD. NBC has reached out to Tamblyn's publicist for comment.